A splendid selection of g.org.e’s delicious , free from chocolate truffles presented in an elegant gift box. Each box contains 24 handmade truffles from g.org.e’s completely organic truffle flavours range. All of g.org.e’s truffles are freshly handmade in small batches. Please note the colour of Raspberry Chocolate Truffle will darken over time and may develop a slight 'bloom', due to the moisture of the truffle, especially if allowed to get warm. They will still taste just as gorgeous though! Shelf life: These are a fresh product, and so are best kept in the fridge and eaten within 2-3 weeks. We recomend freezing them if you're keeping for a gift/later date, to keep them at their absoulte best. * apart from the rum and kirsch! Chocolate Chocolate Truffle: Organic almonds, organic dates, organic raw cacao butter, organic raw cacao liquor, organic raisins, organic raw cacao powder, organic raw cacao nibs, filtered water, organic vanilla powder. --- Coconut ChocolateTruffle: Organic almonds, organic dates, organic raw cacao butter, organic raw cacao liquor, organic raisins, organic raw cacao powder, organic desiccated coconut, filtered water. 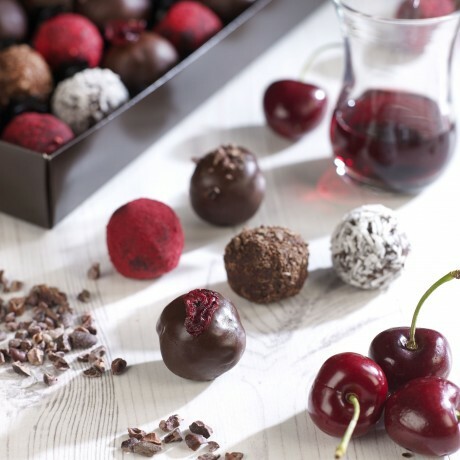 --- Sour Cherry and Kirsch Chocolate Truffle: Organic almonds, organic dates, organic raw cacao butter, organic raw cacao liquor, organic raisins, organic raw cacao powder, organic sour cherries, Kirsch, Cherry Brandy, organic freeze dried cherries. --- Rum Chocolate Truffle: Organic almonds, organic dates, organic raw cacao butter, organic raw cacao liquor, organic raisins, organic raw cacao powder, rum, organic raw cacao solid. --- Raspberry Chocolate Truffle: Organic almonds, organic dates, organic raw cacao butter, organic raw cacao liquor, organic raisins, organic raw cacao powder, organic freeze dried raspberry powder, organic raspberry essence. Pure indulgence for any vegan! Delicious and will keep buying! Delicious and will keep buying! Pls get us more of the chocolate bars soon! My favourite choc. I don't know what I would do without them...!!! Excellent, originally I bought these on eBay at Christmas, they were so good that I went back for more, but they were no longer available but luckily enough, I was able to buy them here, thank you. They were a birthday gift and they came readily gift wrapped in a box. Family recipients were delighted with their surprise gift. Service and delivery couldn't have been better. Great service and yummy chocolates. Absolutely delicious !! My favourites !! This product is dispatched by g.org.e (Guilt-Free Organic Eating Ltd). Please note: this item has special delivery requirements so £0.50 is added to the delivery charges indicated below.